You can view them all after the break. These are so so much better than the Endgame sets. Actually think I'll get all of these. Agreed! Now to go through the fruitless mental arguments why I shouldn't buy these, then getting them anyway. Not sure about these. Molten Man set looks like its thrown together from spare parts... but probably makes sense in the context of the movie. Hydro-man just looks like a boring set choice. The Stark Jet looks very well designed, but a little too plain imo. I don't see much of it but at first glance I like Stark's plane. Very curious about the play and action features hidden inside. And this molten monster / mech looks great too. Super provider of trans orange and golden parts! Very interesting sets and minifigure choices. Mysterio in all sets? I like it. Loving that Peter Parker head. Hoping the spider-mask is a separate piece! Also impressed that Lego haven't just stuck the same Spider-man in each set, although Mysterio is across all of them. Wondering it the Nick Fury fig is the same one as the Helicarrier version form years back? @CCS: Just call me Captain Sensible, The Wallet Avenger!.... Or just GrizBe... that's fine too. Finally a fire extinguisher makes sense in a super heroes set. These looks kinda interesting. Especially compared to the avengers endgame wave. Hydro-Man looks like a Xmas tree. Is this the first Happy Hogan figure? Hydro-Man? Great addition to Ninjago City and Docks! Molten Man? Glad Bionicle & Nexo Knights aren't retired after all! Stark's Plane? Shut up and take my money. How come you just upload one image/set when there are several available? I've noticed this many times for new sets, also sometimes the resolution is much lower than what is available. It's hard to get a good look at them, considering the image size, but the figures for Happy and MJ don't seem to resemble the actors. Wait a second, hold the phone. Spider-Man is restored to life after the events of "Endgame"? A comic book character coming back from the dead? I mean, WHAT ARE THE ODDS? These actually look pretty decent, even though I have very little to zero interest in Marvel. The hYdro-Man set gave me instant flashbacks to the boat chase set from the Indiana Jones line, almost like this is a natural expansion to that (sans the superhero elements, of course). RRP on the first two seems pretty good as well, thumbs up to LEGO for this. oh, my Spidey sense is tingling, so is my wallet. Biggest draw for me: The exclusive minifigs! These look excellent. I'm especially pleased that the Molten Man set includes a civilian. The lack of Black Suit Spidey is disappointing, but the stealth suit version looks perfect. As a SW fan, so jealous for the Marvel fans. While you get a cool, playable monster for a 30€, then we only get ugly huts for this price. OMG. I’m freaking out. Is that a Zendaya minifigure?!?!?! Fun sets and neat minis! 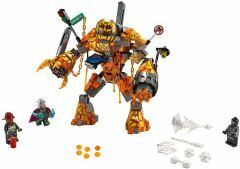 Molten man looks more like a nexo knights set, i like the other two starks plane is really smart, just wish this would of been included in the ironman themed sets along with the Armour room.. I am however disappointed that spidey gets 3 sets and Captain Marvel only got one..
M J has black hair :( there goes my childhood. So, is the film set in Venice and does the Nick Fury figure mean that he comes back from the dead in Endgame. 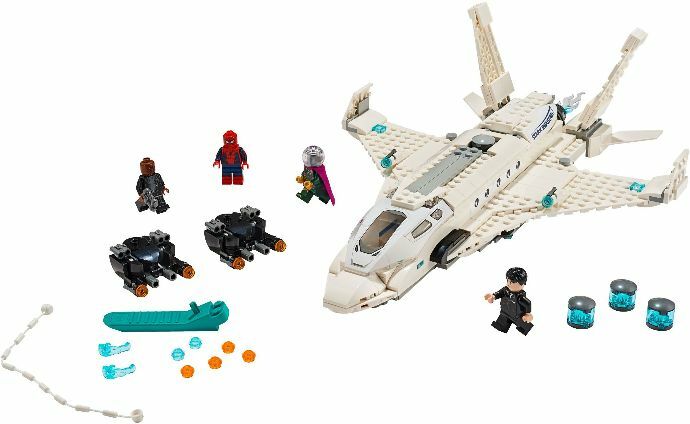 Based on the minifigure selection, Stark Plane is must buy for me. Plus I like sets with Swooshable elements (like planes and spacecraft). @Jackthenipper it's for the sake of diversity, man. Oh can someone please clarify whether or not sandman is in this movie? and according to Imd.com micheal keaton is listed even though he was convicted and jailed in homecoming so does vulture makes a cameo aswell.. I really like the scenery in these sets. Including the street sign and the bridge. Marvel sets are not usually my thing (she says mentally blocking out the many she owns...) however I really like the look of these - think they’d be great in amongst my city, particularly Hydro-Man Attack. So is the big climactic battle going to be on a jet again? Or is that more of a middle scene? Wait, no red-and-black Spidey suit? I have to say though, these sets look very solid. I may have to pick up that Stark jet. So I guess Mysterio will be helping them? Huh. Molten man will look great with my Fire demon army! @bananaworld Agreed. I love it when LEGO puts out products that would be easily compatible with any other range and these monsters would look great with some of the Big Bang themes. I'm loving Molten Man. He takes everything I found cool about Inferno's Mech and the Crystal King from when I was a kid along with everything cool about the NEXO Knights year one Monsters and rolls them into a crazy, fiery, package. And for just $30 bucks with what seems like such impressive height I'd be crazy not to buy! when would these be released? i'm guessing June 1st? "Far from Home" is ... what? Not interesting sets esp that Molten Man one. Why would Lego put such great figs in such rubbish sets?! Granted, Stark's jet is ok, but a bit on the plain side. Why does the Hydro-Man attack set remind me of the Prince of Persia sets? These all look absolutely fantastic! Dare I say one of the best Marvel waves ever...? Makes up for the underwhelming Endgame sets at least. My thoughts. . . the minifigs are outstanding - especially Mysterio and Peter Parker with the hoodie/mask! The builds are unique and nontraditional . . . especially Hydro Man. The Stark Jet is a terrific looking jet, but why no color what so ever? Not even different shades of gray to break it up a bit. Definitely too monotone for me. Also, am I the only one who thinks Molten Man's head looks like a jack-o-lantern? Very upset that Lego once again reused an outdated figure rather than create a new print - why is spiderman's suit blue when in the movie it's black? No Tony Stark/Iron Man figure. That doesn't bode well for End Game. I’ll have to see these in person. And maybe wait for a price reduction. These look great! The prices are good, and I like the dark Spider-Man costume. Why MJ turned to creol? - I thought the new spidey suit for the film was more black and red rather than blue and red? - Happy Hogan might as well be a generic agent or business man or something. Doesn't look anything like his character! Just to stop the flow of constant questions about Spider-Man being dead, I will bring some unnecessary expertise to this topic. No-one is sure when Far From Home will take place in relation to the rest of the Marvel Cinematic Universe. Considering what little we know about the plot of Endgame, anything could be possible. All this time that I've wanted Mysterio, and now my dreams are coming true, big time. C'mon Classic Electro, Kingpin big fig, Daredevil, real Rhino big fig (not that awful mess from a little while back), Betty Brant, Flash Thompson, Uncle Ben (maybe one in ghost form), Spider-Ham and Peni Parker. I am aiming for that plane but I am saddened that it carries so few figures Molten Man looks like a beast of a set (love that shadow operation Spider Man), not loving the HM set although it looks fun. MJ in this isn't Mary Jane Watson, it's Michelle Jones. Is that meant to be a downsized version of the Rialto Bridge? So...is Spider Crawler Sandman supposed to be the movie version? EDIT: Also, three different Mysterios and not one of them seems to come with his unmasked head? What's with that? I only ever buy these for the Minifigures. But 3 Mysterios?...really? You would think it was called ‘Mysterio....Far From Home’. I love the Venice set - the scenery, the minifigs, the price tag. The jet looks good, but the price is just too high. I noticed a couple people complaining about all the Mysterio figures, but I'm actually excited they did this, as I can build a (small) set of Mysterio duplicates just by buying the sets. Gotta love the Marvel and DC Super Hero sets - except the DC movie sets since you can’t make a good set from a lousy movie - so yeah, gonna buy these. Really hoping for some a Fantastic Four and X-Men sets next year! Not a fan of anything here. End game sets look way better IMHO. The fire beasts head isn't even brick built. Jet is ordinary and the little bridge is yet another half built facade. A couple of figures look ok but I might skip the sets as nothing is drawing me in. Mysterio is my favorite Marvel villain of all time, so seeing him in every set is making me very happy. Where is the new red and black suit??? The one in the Stark Jet set might be it but it looks blue in the pictures.